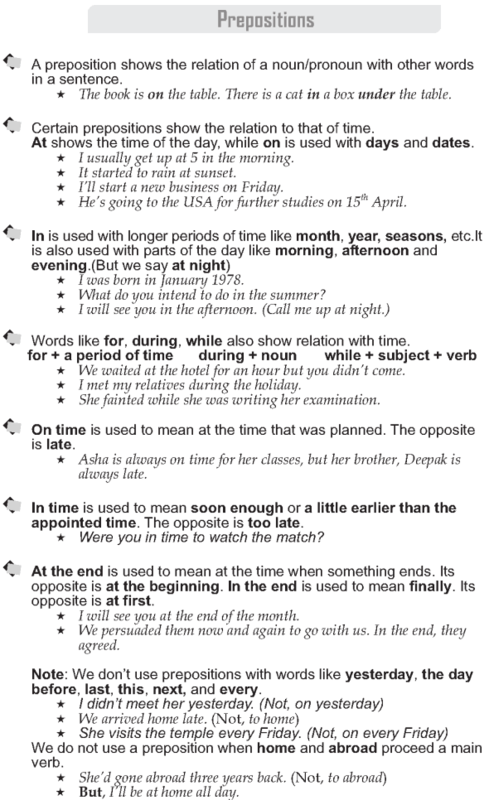 What are some prepositions of time? When do we use the preposition ‘at’? When do we use the preposition ‘on’? When do we use the preposition ‘in’? What is the difference between ‘at the end’ and ‘in the end’? Do we also use prepositions with words like ‘yesterday’, ‘the day before’ etc? A preposition shows the relation of a noun/pronoun with other words in a sentence. Certain prepositions show the relation to that of time. At shows the time of the day, while on is used with days and dates. On time is used to mean at the time that was planned. The opposite is late. In time is used to mean soon enough or a little earlier than the appointed time. The opposite is too late. At the end is used to mean at the time when something ends. Its opposite is at the beginning. In the end is used to mean finally. Its opposite is at first. Note: We don’t use prepositions with words like yesterday, the day before, last, this, next, and every. We do not use a preposition when home and abroad proceed a main verb.